- They are missing Austin Jackson. He not only keys the top of their batting order, but is the Tigers' best defender at a premier position, center field. Last season in May and early June, Jackson went on the disabled list, as well. The Tigers were 8-13 in the games he missed. In 2012 overall, the Tigers were 80-57 when Jackson played. When he didn't, they were 8-17. This season, the Tigers are 3-5 since Jackson went on the DL with a hamstring pull. Two of those victories were at home against lowly Houston. ﻿﻿﻿﻿﻿﻿﻿﻿- The Tigers' starting pitching, their great strength, was awful over the weekend. Facing a strong lineup in a hitter-friendly ball park, Justin Verlander, Anibal Sanchez and Doug Fister didn't pitch well at all. We'll see how Max Scherzer, who is 5-0, but with an ERA pushing four, does in a pressure start against a streaking team, the Indians, on the road Tuesday. 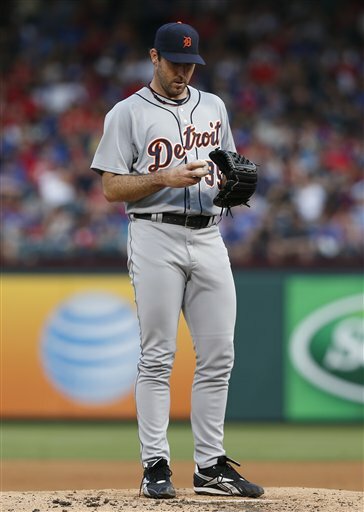 Verlander gets his shot at turning it around in a pressure start Wednesday vs. AL Central leading Tribe. Verlander has not pitched well at Progressive Field in Cleveland. His career numbers there: 7-10, 5.38 ERA, 1.339 WHIP. Should be interesting. Glad you didn't sensationalize it and say that yesterday's loss proved the Tigers aren't that good. Your reasons are spot on. Hard to win in baseball without starting pitching. We have it most nights, but didn't in Texas. We'll be fine, isn't it amazing that Caberra and Fielder have 84 combined RBIs at 25% of season? We're a hitting machine that leads the league in runs scored, hitting, OPS. Just need to get the pitching kinda straightened out and Martinez hitting. Leyland needs to focus even though he lost his big bet on the Preakness. He'll be OK.